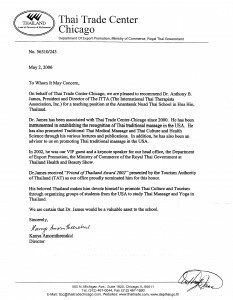 Dr. Anthony B. James, Director of Education receives formal letter of recommendation for Thai Yoga and Massage from Thai Trade Department. “On behalf of Thai Trade Center-Chicago, We are pleased to recommend Dr. Anthony James, President and Director of the ITTA (The International Thai Therapists Association, Inc.) for a teaching position at the Anantasuk Nuad Thai School in Hua Hin, Thailand. 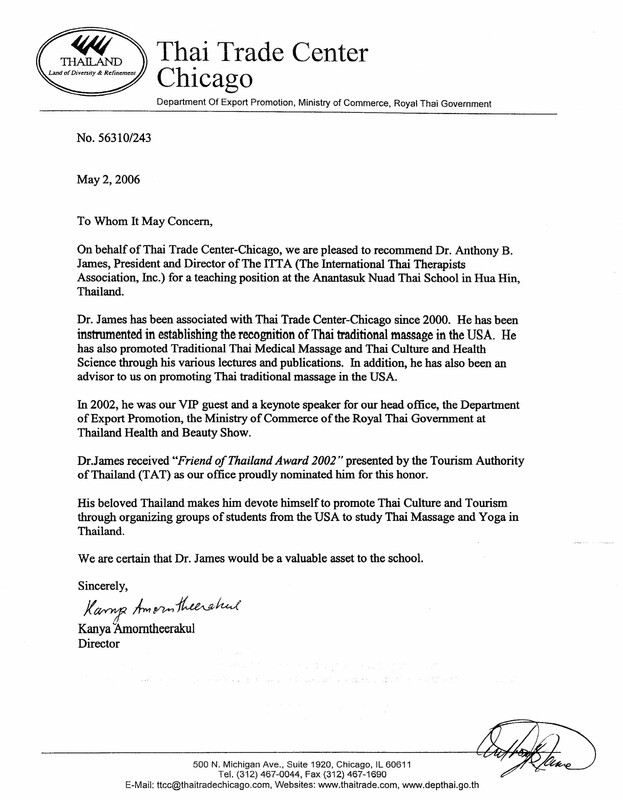 Dr. James has been associated with the Thai Trade Center-Chicago since 2000. He has been instrumental in establishing the recognition of Thai traditional massage in the USA. He has also promoted Traditional Thai Medical Massage and Thai Culture and Health Science through his various lectures and publications. In addition, he has also been an advisor to us on promoting Thai traditional massage in the USA. In 2002 , he was our VIP guest and a Keynote speaker for our head office, the Department of Export Promotion, the Ministry of Commerce of the Royal Thai Government at the Thailand Health and Beauty Show. Dr. James received “Friend of Thailand Award 2002″ Presented by the Tourism Authority of Thailand (TAT) as our office nominated him for this honor. Original Copy of this letter available on file with NAIC office.